Punggol New Town is located at the northeastern part of Singapore. Under the “Punggol 21” plan, this new waterfront town is on its way to become Singapore’s New-age town filled with residential HDB flats, Condominiums, recreational facilities and a waterfront living centre. Sengkang New Town is right beside Punggol. Pasir Ris- Punggol Group Representation Constituency comprises of Pasir Ris Town, Punggol Town, and a small northern part of Hougang of Compassvale of Sengkang. This area is led by the PAP party. Punggol East after the by-election held in 2013 is now under the Worker’s Party. 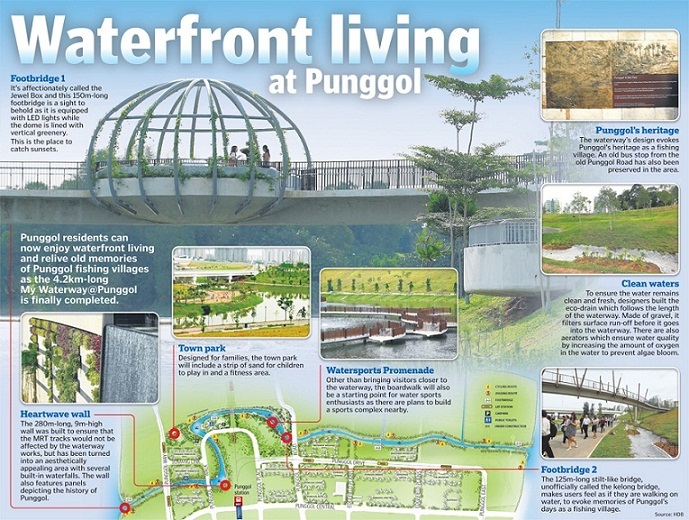 So what does the word “Punggol” mean? In Malay, Punggol means “hurling sticks at fruit trees to bring the fruits to the ground”. It also refers to a place where the malays sell their fruits wholesale. In Tamil, Pongal is a festival celebrated on the first date of the month Thai and also a sweet especially made for that day. Interestingly on the 1828 Franklin and Johnson’s Map of Singapore, Tanjong Punggol appears as Tanjong Rangon. In the past, the stretches of lands from Jalan Kayu to Punggol to Buangkok are filled with farms and plantations. Hence the roads leading to them are called farmways namely Seletar West Farmways, Punggol Farmways, Seletar East Farmways, Cheng Lim Farmways and Buangkok North and South Farmways. Kampong Punggol is believed to have existed more than 200 years ago before Sir Stamford Raffles set foot on Singapore. The settlers back then were mainly Malays who were fishermen. Fishing was their main activity besides growing some self- sustaining vegetables and fruits. In the 19th century, more Chinese settlers and immigrants settled in Punggol and start up rubber plantations, poultry farms and pig rearing activities. There used to be a market place at the former eight milestone of Punggol Road where farmers trade their fruits, vegetable and farm produce. The Serangoon River Mouth is a popular place where fishermen trade their catch of the day. In 1970s, measures to improve water standards include to relocate pig farms that produced waste which pollute the water. Land vacated was then converted into vegetable and fruit farms. Pig rearing sites were relocated to other allocated pig-farming sites from 1976 to 1980. Pig rearing farms near water catchment areas were ceased by 1981. Slowly pig farms begin to phase out and the last pig farm closed down in 1990. 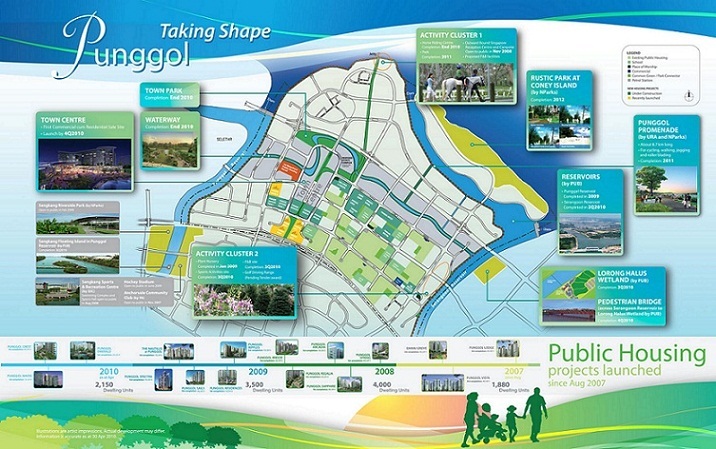 Punggol 21: This is a plan to develop Punggol during the 1996 National Day Rally. Unfortunately by 2008, only 16,000 instead of the 80,000 HDB planned flats were built. There is also just one shopping mall Punggol Plaza, coffeshop and a 24 hour minimart. To live up to the expectations of the proposed Punggol development, Punggol 21 Plus plan is introduced. 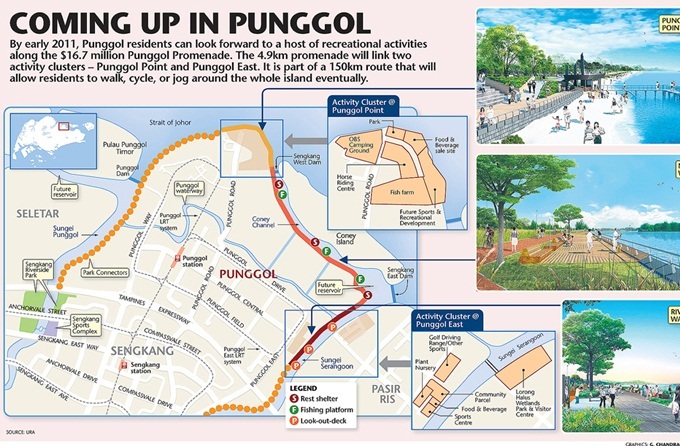 Plans have been made to make changes and develop Punggol into a brand new enticing vibrant town. Since then more HDB flats, private residential developments, recreational spots like Punggol Point, Nature Walk at Punggol Promenade and prawning sites, delicious seafood restaurants, and commercial developments are sprouting out one by one in this exciting new town. There are so many ongoing plans to Jazz up Punggol to make it the trendiest Town. Punggol Matilda is an upcoming district in Punggol. 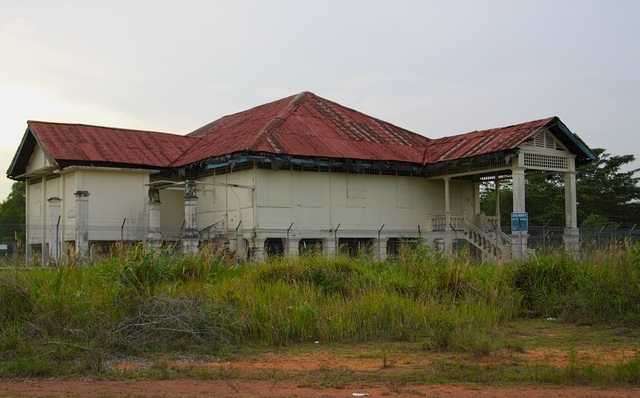 It was inspired by the Matilda House, a colonial house built in 1902 at Punggol’s waterfront which will be described below under Punggol’s History. 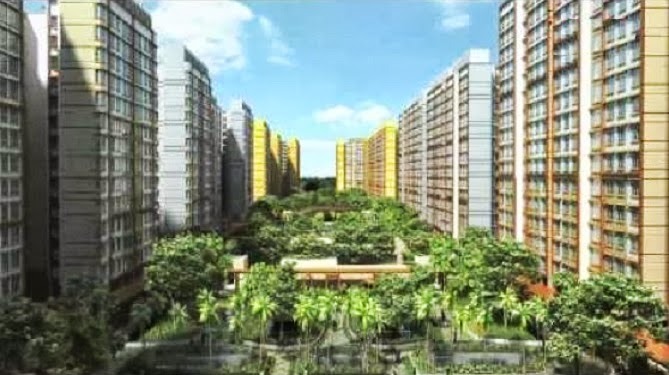 This Punggol Matilda development will feature 8000 units of 3-4 room flats for about 28,000 residents. This new development will have flats built around an elevated landscaped deck with verandahs, colonnades and a pavilion surrounded by tree groves. To connect residents of Punggol Matilda to the Punggol Waterfront there will be 3 connecting corridors. The central one will have a community street with a possible waterfront shopping centre, retail shops and F&B outlets to serve the residents and link them via a sheltered path to Punggol Waterfront. The other 2 corridors will be greenery boulevards lined with trees to resemble the olden day’s tropical fruit orchard the surrounded the old Matilda House. Transportation: Modes of transportation are made easy via Punggol Mrt station along Northeast line, Punggol Lrt system and the numerous bus services available at the interchange. Major expressway like KPE, CTE, SLE and TPE will allow vehicle owners easy access to and fro many parts of Singapore. Driving to Orchard shopping district or central business district will take you about 15 minutes. Recreational facilities in the neighborhood include Punggol Point, Punggol Promenade, Punggol Park, Punggol Beach, Punggol Community Centre, Marina Country Club & Resorts and Punggol Waterway. Shopping Malls: For those who love to shop and dine, you can head down to the nearby malls which include Punggol Plaza, Rivervale Mall and Compass Point. For more shopping, dining and entertainment purposes you can drive down to Orchard or Pasir Ris which is about 15 to 20 minutes away. The nearest supermarkets are Cold Storage at Compass Point, NTUC Fairprice at Rivervale Mall, Prime Supermarket at Punggol Field and Sheng Siong Supermarket at Punggol Central. Restaurants: Foodies can head towards the famous eateries and restaurants in Sengkang as well as the many seafood restaurants in Punggol. Education: The primary educational institutions around include Edgeview Primary School, Greendale Primary School, Compassvale Primary School, Rivervale Primary School and Horizon Primary School. The Secondary Schools in the neighborhood include Punggol Secondary School, Greendale Secondary School, Compassvale Secondary School, Mee Toh School and Edgeview Secondary School. 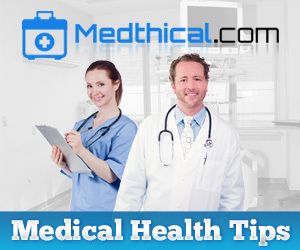 Healthcare: For medical consult, you can head to the nearby General Practitioner Clinics, SengKang Polyclinic, Ren Ci Hospital, Bright Vision Hospital and Changi General Hospital in the area to provide specialist healthcare services for the residents. Places of worship: These include Fo Guang Shan at 1 Punggol Place, Sheng Jia Temple at 3 Tebing Lane, River of Life Community Church at 19 Ponggol 24 Avenue and Central Christian Church at 1 Edgefield Walk. 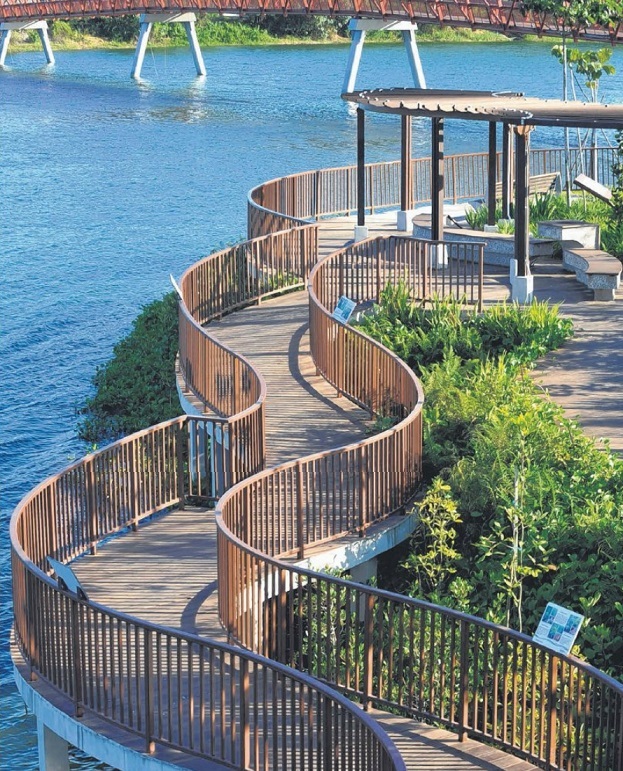 Waterfront living at Punggol has made this a popular designation among locals and expatriates, due to its ease of access to any parts of Singapore, wide array of facilities and bountiful mix of entertainment. Living here in this urban sanctuary reflects the ultimate dream that make any other possession secondary. It is definitely a true work, play and live nature retreat after a long day at work. Here, you can live your life according to your own rules. Right here, you can find equilibrium and tranquility and get fully recharged for new challenges ahead. Punggol Beach Massacre was part of the Sook Ching massacre (simplified Chinese: 肃清大屠杀; Japanese: hingapōru Daikenshō シンガポール大検証) that took place during the Japanese Occupation of Singapore after the British colony surrended on 15 Feb 1942. It was an extermination of Chinese activists who donate to Chongqing to fight the Japanese then. Chinese Men between the ages of 18 to 50 will be brought to “screening centers” by Japanese Kempeitai officers. Those thought to be involved in anti-Japanese activities or those who look suspicious or those who have tattoos associated with secret societies will be chosen and stamped with triangular marks to be held as prisoners or executed. Those who passed through the examinations will be stamped square ink marks/given certificate and released. Those who did not passed the “screening examination” will be taken to the execution sites at Punggol Beach, Changi Beach and Sentosa to be executed. The Punggol Beach Massacre on 28 February 1942 by the Hojo Kempei firing squad saw about 300 to 400 Chinese shot at Punggol Beach. The current Changi Beach Park was where one of the most brutal killings in Singaporean history was conducted. On 20 February 1942, 66 Chinese males were lined up and shot by the Japanese military police. Berhala Reping at Sentosa Beach was another site where many were executed. Sook Ching massacre extended to the rest of Malaya especially Penang. According to Singaporean Chinese Community the death toll is estimated to be around 50,000 to 100,000. The war ended in 1947, the British authorities held a War Crime Trial against 7 Japanese Officers responsible for the massacre. 2 of them Masayuki Oishi & Saburo Kawamura received death penalty and the other 5 (Takuma Nishimura, Yoshitaka Yokata, Tomotatsu Jo, Satoru Onishi and Haruji Hisamatsu ) life imprisonment sentence. After Singapore Independence 1965, Japan agreed to pay $50 million in compensation. The massacre sites at Sentosa, Punggol and Changi were marked as national heritage sites by the National Monuments of Singapore in 1995. 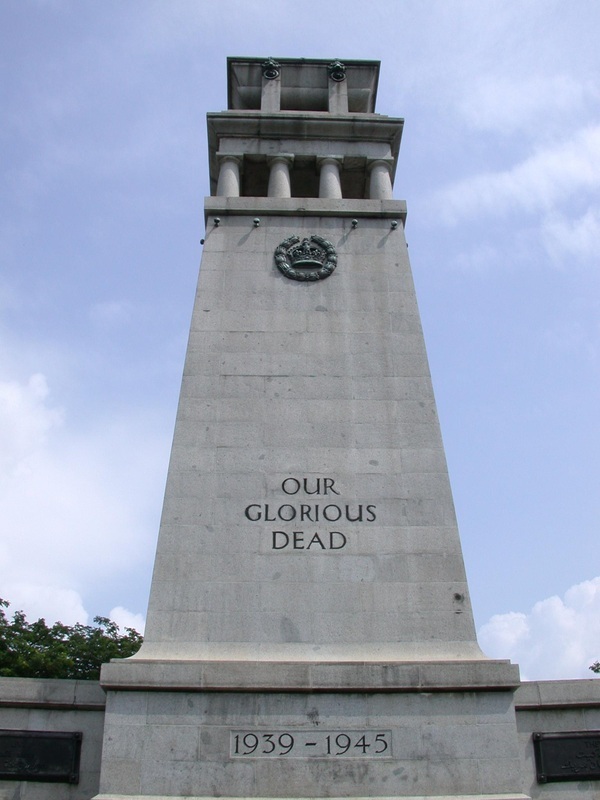 They serve to commemorate the end of Japanese occupation and to remind us of those who died during the war. MM Mr Lee Kuan Yew once said on the Discovery Channel programme which discussed about the Sook Ching Massacre, "It was the catastrophic consequences of the war that changed the mindset, that my generation decided that, 'No...This doesn't make sense. We should be able to run this [island] as well as the British did, if not better. '""The Asiatics had looked to them for leadership, and they had failed them." Matilda house also called Istana Menanti (“Waiting Palace” in Malay) was built in 1902 by Irish Lawyer Joseph William Cashin for his wife. It acted like a weekend resort house for this wealthy family. They also have other houses in Singapore like The Pier at Lim Chu Kang (also a weekend resort) and “Butterfly House” at Amber Road. Matilda House occupies 417 square feet. It has distinct red roof and white walls. There are a total of 6 bedrooms and a tennis court. Now it is just a dilapidated ruined house. The Cashins moved out many decades ago. Urban Redevelopment Authority put this house on the conservation list in 2000. There have been bids by developers over this plot of land and its surroundings. If successful, this century old house will probably be converted into a clubhouse?